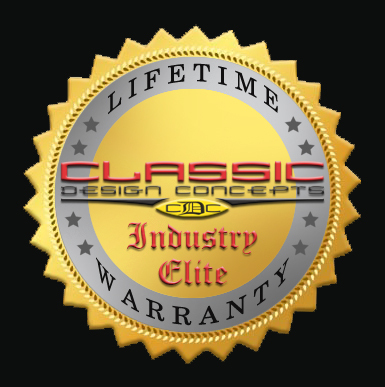 We are pleased to offer our Lifetime Product Warranty on products engineered and manufactured by Classic Design Concepts (CDC) effective October 1, 2010. Our Lifetime Warranty covers all manufacturer defects in materials and workmanship. Warranty does not cover labor for removal, installation, paint or any other labor charge for the part which you are requesting replacement. Classic Design Concepts (CDC) provides detailed installation instructions for every product. It is the responsibility of the purchaser / installer to ensure these instructions are followed properly and all components are test-fit prior to any paint application. CDC will not be responsible for damages caused by misuse, altered or improperly installed products. This warranty is in effect for as long as you own your vehicle. Coverage terminates upon sale or transfer of the vehicle. Warranty covers all components manufactured by CDC. All components not covered under our Lifetime Warranty, will continue to carry our Industry-Leading 3 year warranty. Excluded from either warranty are any parts sold “as is”; i.e. garage sale parts. We will inspect the product and contact you within 72 hours to give the results of our inspection and determination of replacement eligibility. If your product qualifies for Lifetime Product Warranty, you will be contacted to arrange shipping or pick up of your replacement part. There is no charge for inspection and eligibility determination. If you have any questions please call us at 866-624-7997.